Integrated auto-update feature (of itself not the mods). The W3MM will check for updates each time you start it. If found it will ask you if you want to install them. Download and install process can last about a minute so give it a little bit of time. Improved input.settings keys handling. If it finds a key already installed but with changed hotkey it will ask you if you want to keep yours or reset to original. This feature allows you to have mod still installed while not being active as the game ignores it. This feature allows you to install merged scripts between 2 or more mods created by someone else. This feature installs them in a way that to not leave any conflict between the 2 mods if downloaded merged scripts are correct. Improved detection and installation algorithm, as well as combining those 2 processes into one therefore, speed and stability should be greatly improved! It is a tool that allows you to install and uninstall Witcher 3 mods in one click with a meny more features! 1) Select one or more mods in the list and you can either click on Uninstall Mods, go to Mods/Uninstall Mods, right click on them and select Uninstall Selected Mods or press Delete button on the keyboard. 2) Confirm, and it's done. To disable one or more mods, simply select them in the list and you can either click on Enable/Disable Mods, go to Mods/Enable/Disable Mods, right click on them and select Enable/Disable Selected Mods, press Ctrl+Q on the keyboard or you can simply double click on the mod. If the selected file is archive it extracts it first and then does the same things as for regular folder. The installer searches through all files and folders within selected folder trying to find files it needs. Searches mod* folders for actual mod data, dlc folder for dlc data, .xmls for mod menus, .txt files and input.xml file for keys. Therefore inner structure doesn't matter much, if it's there the installer is going to find it. Also when reading txt files it will ignore any text that is not in a structure of input.xml or input.settings, and when it finds correct lines it will extract them and use them later. 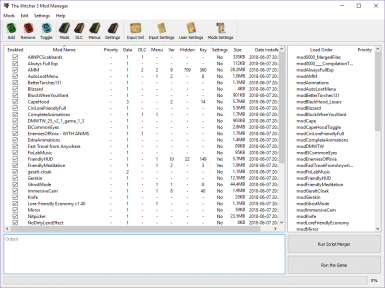 After it detects all files and folders, it copies all mod* folders to Game\Mods folder, DLC folders to Game\DLC folder, mod menu xmls to Game\bin\config\r4game\user_config_matrix\pc folder. After that if it found and key lines, first it opens input.xml and looks for them, if not found it adds lines above <!-- [BASE_CharacterMovement] --> line. If input.xml file is provided by mod author and not only new Vars, installer will extract all lines from it and will try to add them. Since only new lines are different only they should be added. Also if mod author defined a new xml group in input.xml, the whole group will be put in the correct position and not above base_characterMovement. Same thing happnes to input.settings except it searches for them based on the context they are in and adds them to their correct context. As for user.settings it just adds lines on the beginning of the file, as the game merges those automatically and uses last written value for the setting. The Installer deletes selected mod* folder, searches to see if that mod added any mod dlc files, menus or lines to input.xml, if it did it deletes them too. Note that only the mods installed using this installer will have their input.xml lines, dlc files and mod menus deleted. For the ones you already have you have do it manually or reinstall them using the installer. When you choose to disable selected mod ( or mods ) it renames mod* folder to ~mod* folder, making the game ignore it. It also disables all other files added by the mod, as it renames all dlc files (blobs, metadatas, textures etc) and adds them .disabled extention, renames all mod menu *.xml to *.xml.disabled and removes all keys from input.xml. When you select to enable it back it basically reverts everything disabling process did and restores the mod back to normal.